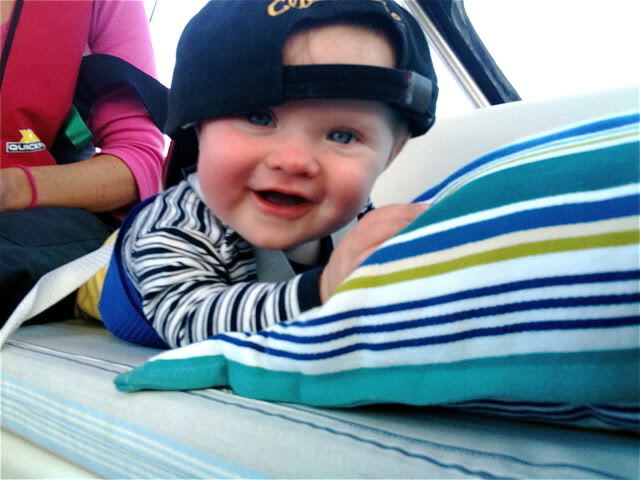 When we decided to move on to our boat and sail the Great Barrief Reef with our 6 month baby we were faced with a mixed response from friends and family. Our friends and family initially thought we had gone mad, but largely their fears were founded in naivety. They imagined storms and large seas, images of the Titanic and the Perfect Storm were flashing through their heads without them actually understanding what we were doing, and what we were doing to address the REAL risks involved. Plenty of people have made the point, that sailing aboard a seaworthy vessel is statistically far safer than being on a major highway in a car. We firmly believe this. Once we got our family and friends past these fears, they too became excited by what we were doing. 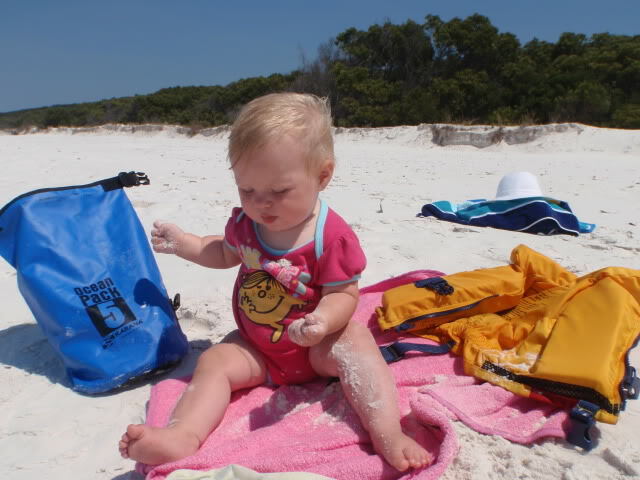 Being able to ‘ do life’ slowly together as a family cruising, discovering new places and meeting new people is a fantastic way to raise kids. What do you do with her at sea? While our sailing friends understood than sailing is essentially safe, this was the question they generally asked most. Soph loves passages and being at sea. The motion of the boat that alot of adults find difficult to get used to she seems to find calming and relaxing. She watches us get the boat moving ( And tries to help, she is still upset that she can’t winch the Mainsail up herself yet!) and then after a snack or two she will happily draw, watch DVD’s, look for Dolphins and then cuddle up somewhere and sleep for long stints. When she was younger, she would sleep 80% of the time on passages. Now it is a bit less. When she was younger she would sleep in a ‘Cot berth’ we made up with a lee cloth in the aft cabin. 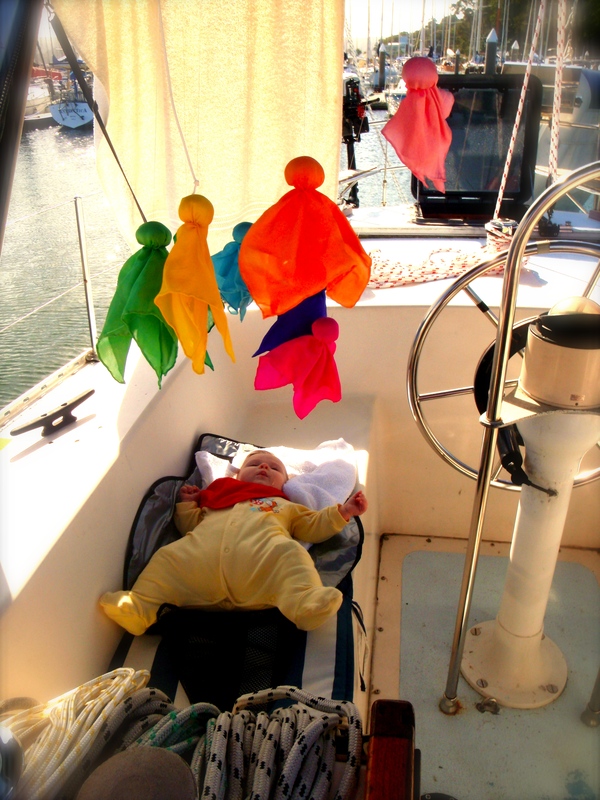 Is it difficult living on a boat with a baby?? No. Not really. It was easier than we thought, albeit an adjustment. Having two parents available working together as a team most of the time made it for us easier than our busy shore lives which had involved juggling work, commitments and parenting. Cruising is about waiting and doing things a bit more in tune with the natural rhythms of the world. You can’t schedule things cruising, you just have to go with flow. Babies tend to be the same, so what a great combination! Things did take longer with Sophie. Other cruisers we knew would have walked up and down a mountain, been snorkelling and kayaking and grilling fish they had just caught for lunch, while we were still finishing breakfast and trying to wash baby clothes! Living in close quarters also took some adjusting, but found that we soon got used to it, the layout of our boat was fantastic allowing different spaces for different activities both at sea and anchor. First things being first, after deciding to take our daughter offshore we began by looking at our boat and ourselves. It was important that the boat be utterly seaworthy, and that we were confident able sailors. I was losing sleep over our rigging. It was of an undetermined age and probably older than 10 years, so it went. Lifelines were replaced. Seacocks were replaced. Bilge pumps added. We examined objectively, the REAL risks involved and made sure we had answers to all possible scenarios. One concern was what we would do if Sophie was either sick or injured.We spent alot of time on our medical kit, we both obtained senior first aid certificates and then did a fair amount of continued research because contrary to the premise of alot of first aid training, if a child is injured/ill on a boat then an ambulance is not 15 min away. We also arranged to have the number for a known/reliable emergency doctor that we could contact by Sat Phone 24/7. As a backup the flying doctor service in Australia is also a good resource to contact in a emergency. Beyond that we looked carefully at safety gear for Soph. I had received a great recommendation to look into Mustang lifejackets for kids from Brian (CruisingDad @ Sailnet). We did and were impressed, this combined with a Burke kids safety harness were the start. To her Lifejacket I added two lifejacket lights. We have recently added lifeline netting as Sophie is much more mobile now!!! Is Sophie always tethered to the boat and/or wears her lifejacket? If she’s not three yet (or when she wasn’t) did she wear the bulky ones? Thanks for sharing your story – always encouraging that one is not the only so called crazy (Really? It feels so normal!) sea vagabond family out there. Not Always no…………Tethering/lifejackets continues to be one of those issues that is ummmmmmmm a work in progress!!! 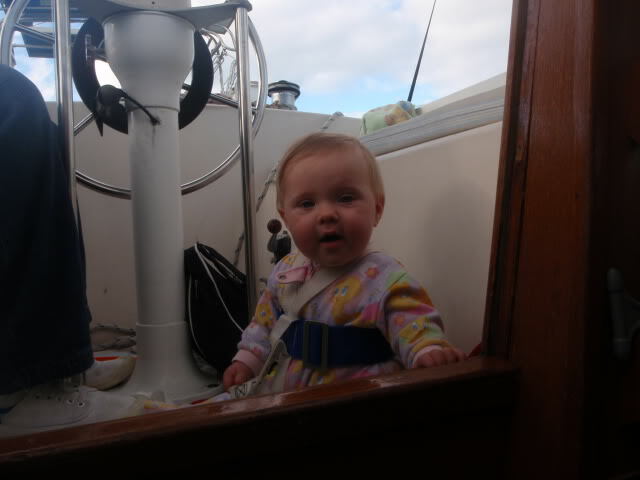 When Sophie was a baby,\ if she was in the cockpit we would tether her if on passage (but with no lifejacket) and she seemed cool with that. Being a centre cockpit boat we found it mean’t that if something needed doing in a hurry or we were distracted she was always safe. 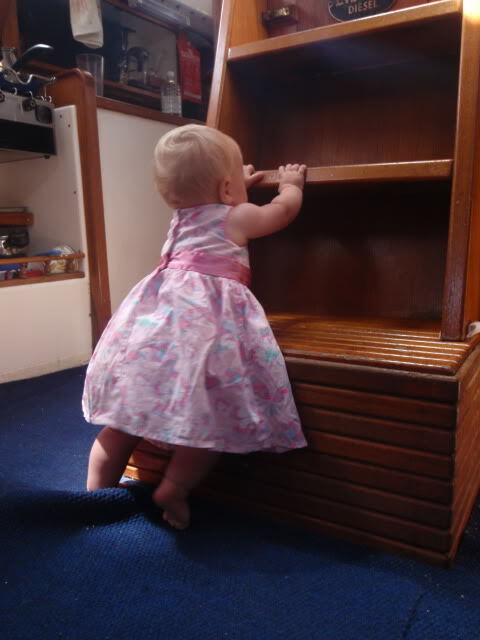 The Burke Child harness was far easier and more comfortable for her as a baby than any of the lifejacket options which are a little bulky ….still in the dinghy it was always lifejacket on and when at anchor we keep her on a lifejacket in the cockpit and on deck. Below deck she didn’t wear a lifejacket. Now at three years old( even though she is in a slightly less bulky lifejacket) the above system is working less and less………keeping her lifejacket on her in the cockpit at anchor as we are sitting around having lunch for example has become harder……so while we still insist on tethering on passage, at anchor we only insist on the lifejacket if she is outside of the cockpit playing, or we are busy. Having said this we do also have lifeline netting, and Sophie has been doing swimming lessons since she was 3 months old and she is now an ok swimmer, (we practice ‘humpty dumpty’ falling off the side of the boat and swimming around to the back a fair bit….) so I am less worried about her at anchor than when she was a baby. Whether this is the best ‘system’ I am not sure, it is under continual review and I am always interested in what works for other people!